AP D.Ed 1st year Exam Dates/ Time table, Hall tickets 2017-19 batch @ bse.ap.gov.in. AP D.Ed First Year Exams Time table at bseap.gov.in. AP D.Ed I Year Exams 2018 Schedule for 2017-19 Batch Candidates. AP D.Ed 1st Year Public Exams Dates/ Time Table for 2017-2019 batch Students, AP DEd (D.EI.Ed) First/ 1st year Examinations for 2017-19 batch Examination Scheduled/ Time Table Scheduled Download as per Rc No.15/C-1/2018 Dated:13-03-2019. AP D.Ed 1st Year Annual Exams Schedule 2019. AP D.Ed 1st Year Exams Time Table/Hall Tickets 2019 AP DEd First Year Exams Time Table 2019 AP D.Ed 1st Year Public Exams Time Table for 2017-2019 batch, AP D.Ed 1st Year Annual Exams Schedule 2019 AP D.Ed I year Exam Time Table for Regular and Backlog Batch of 2017-19. AP D.Ed (D.El.Ed ) Course Annual Exams 2019 Time table, Andhra Pradesh D.ed Course Annual Exams Exam Dates released by bscap. Andhra Pradesh D.El.Ed 1st year Examinations of 2017-19 batch will be conducted in the month of July 2019. It is hereby informed that the following is the timetable for D.E.d 1st year Examinations of 2017-2019 batch and for failed candidates of previous batch also. Exams held on 09.05.2019 to 15.05.2019 time 9:00 A.M to 12:00 P.M. DIET (DEd) First Year Examination Scheduled 2017-2019 Batch Exams held from 09.05.2019 to 15.05.2019. Organisation: Board of Secondary Education, Andhra Pradesh. Name of the Exam: 1st Year Examinations. Exam Courses: (D.El.Ed) Diploma in Elementary Education. Category: Exams timetable Status: Available Now. Fee Structure :- The Examination fee is Rs.150/- for regular candidates. The fee has to be remitted separately for regular & once failed candidates through separate consolidated challans in the Government Treasury to the following Head of Account. 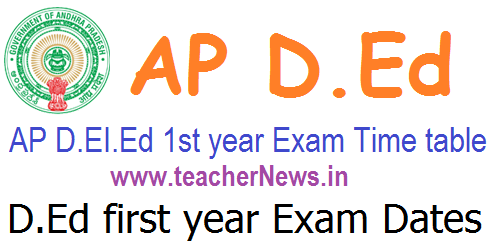 AP D.Ed 1st Year 2019 Time table, AP D.Ed Time table 2019 D.Ed first year students Download Exam Dates at School Education Official website. AP D.Ed 1st Year Exam Dates 2019 Hall tickets, Results Download here.